PR2 Motor Work, a Titanium megabomb header and silencer, New Renthal chain and sprockets,new Sunline handlebars, New evs shorty front brake lever, New Sunline multidirectional clutch lever, New Sunline stainless pegs, Sunline hand guards, Universal top triple clamp, works connection radiator braces, New radiators, Front Pro Wheel Rim (Black) and spokes. 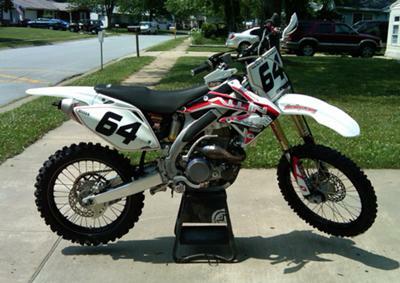 The tires on the 2006 Honda CRF 450R for sale are in great shape, it has new white plastic and it has 5 Rides on the rebuilt motor and 3 Rides on the rebuilt suspension (Factory Connection 175lb rider). The used honda dirt bike for sale also has stock pegs, levers, triple clamp, radiators, Extra set of used plastic (red), several oil filters, air filters, nut and bolt kit, tubes, cables, folding aluminum ramp, mouse stand - metal (black), excel spoke torque wrench, step seat (black), carbon fiber engine guard, aluminum skid plate, stock seat and cover, two extra rear tires (1 ride a piece)and more. I'm selling the bike because I am retiring From the Sport! f you are interested you can leave your questions and contact information in the space below provided by Strike Lightning Used Honda Dirt Bikes for Sale and Matt, the owner, will get back with you as soon as possible. Strike Lightning would also encourage bikers to submit a review of the 2006 Honda CRF 450R for sale to help potential buyers make informed decisions and to benefit the biker community as a whole. It's located in West Chester Pennsylvania or Newark Delaware and my asking price is a very cheap $3,600.00. If u ask me ur asking a little bit to much for it. I saw a 450r for sale for only $2000. But I like yours a lot if you think you might lower the price some email me tigger.blackburn09 at gmail.com.